I have a secret love of porridge, and, in the winter months, it is one of our favorite breakfasts. 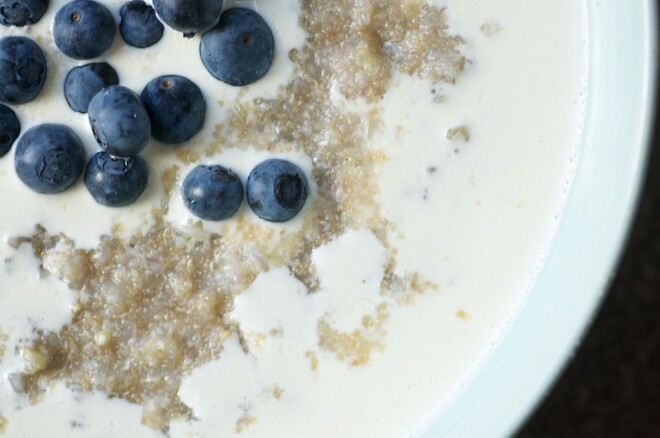 We eat soaked oatmeal porridge, mostly, and congee from time to time, but occasionally I like to focus on other grains and pseudocereals like buckwheat, amaranth and quinoa whose grassy undertones blossom when paired with fresh blueberries, heavy cream and a generous dose of fresh ginger. These breakfasts are invariably served with fried eggs and wilted greens – Swiss chard or spinach, mostly. It’s a lovely way to start the morning. Not quite grains, buckwheat, amaranth and quinoa are the seeds of broad-leafed plants. Grains, in case you’re wondering, are the seeds of grasses. Buckwheat, amaranth and quinoa are pseudocereals; that is, they’re false cereal grains that we use like cereal grains. They’re gluten-free (only true cereal grains contain gluten, but not all cereal grains do) and paseudocereals typically pack a lot of nutrition into a very small package. Buckwheat is rich in niacin, pantothenic acid, riboflavin, manganese, magnesium, phosphorus, copper and zince as well as a potent flavonoid called rutin. Rutin, like other antioxidants, extends the power of vitamin C, and, as such is strongly anti-inflammatory. Rutin can also help protect LDL cholesterol from oxidation. Buckwheat is also extraordinarily rich in the enzyme phytase which helps to break down phytic acid, a naturally occurring antinutrient that can block your body’s ability to absorb minerals. I love amaranth, another pseudocereal, for its tiny, pale beige seeds. Amaranth leaves are also used in cooking, though most people are better familiar with amaranth’s use as a decorative plant. Amaranth is rich in iron, magnesium, phosphorus and manganese. Quinoa is an enormously popular pseudocereal with an overt grassy flavor. When cooked, its germ is released and it curls up against the grain in a sort of spiral. Quinoa is a good source of folate, and, like most other seeds, it is also a good source of manganese, magnesium and phosphorus. Like buckwheat, it is also a good source of the amino acid tryptophan which is known for its calming properties. Much in the way that hoppy beer and oatmeal are recommended for nursing mothers in western cultures, quinoa was also traditionally used as a galactologue; that is, it was used to stimulate the flow of milk in breastfeeding mothers. In Nutrition and Physical Degeneration, a landmark book penned by a Cleveland dentist and intrepid researcher who traveled the world analyzing the native diets of healthy populations, quinoa porridge is used by both African and Peruvian mothers to stimulate the flow of milk. All grains, nuts, seeds, pulses and pseudocereals benefit from proper preparation, and our recent love of these whole foods has come somewhat to our detriment. You see, while many people embrace a return to whole foods like quinoa, buckwheat, nuts, lentils and whole grains, they fail to understand that these foods require special preparation without which their stunning array of minerals is not well-absorbed. Further, without proper preparation, these foods can be difficult to digest. 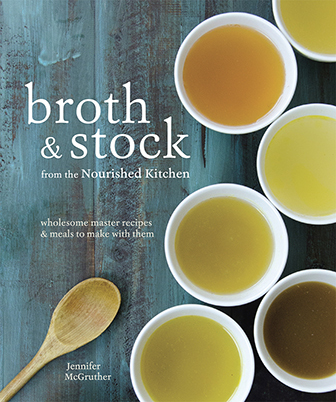 To receive the greatest nutritional benefit from these foods, they must be soaked, soured or sprouted and cooked. These traditional processes help to activate food enzymes like phytase which then, in turn, deactivate antinutrients. The end result is that your foods offer your body a greater array of absorbable minerals while also increasing overall digestibility. Indeed, when traditional peoples prepared porridges and breads, they used freshly ground meals and flours that were summarily prepared through soaking or souring. 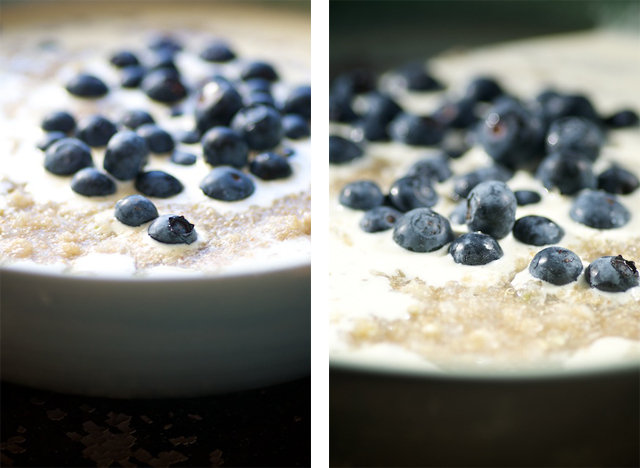 Blueberries, ginger and cinnamon complete this simple porridge featuring three of my favorite seeds for cooking: buckwheat, amaranth and quinoa. The night before you plan to serve the porridge, coarsely grind buckwheat and quinoa in a hand-crank grain grind or a spice grinder. Transfer the freshly ground buckwheat and quinoa to a mixing bowl and stir in amaranth. 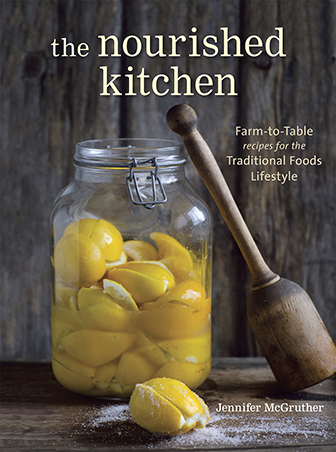 Cover with three to four cups hot water and stir in one tablespoon lemon juice. Allow the pseudocereals to soak for at least twelve hours. Drain and rinse. Melt ghee in a medium-sized heavy-bottom saucepan over moderate heat, stir in ginger and fry until fragrant – about three minutes. Reduce heat to medium-low and stir in soaked buckwheat, quinoa and amaranth as well as unrefined sea salt and whole milk or heavy cream. Add a cinnamon stick to the pot and simmer, stirring continuously for eight to ten minutes or until the porridge is cooked through and thickened to your liking. Remove cinnamon stick from porridge, fold in blueberries. Sweeten to taste with maple syrup or honey, and serve with additional whole milk or heavy cream as it suits you. I made this last week and it was absolutely delicious! Would this be ok just subbing water for the milk/cream? My soaked grains seemed like a porridge in and of themselves. There wasn’t much to drain unless I pushed liquid out of the mixture. Then I only added 2 cups of milk and it seemed way too runny. What did I do wrong?! The flavor was of course still delicious. Can I use it as a sour dough starter?? Hey Jenny, As always this looks delicious. I just had a new grain recipe here in Beijing a coupe weekends ago that made me think of you. It was a millet congee and it was delicious! Soaked my seeds last night and made the porridge this morning. I’m curious, what’s the best way to rinse the soaked seeds? I lost a lot of the seed during the rinse process. Is it necessary to actually strain them, or just pour off the liquid on top, add fresh water, let sit and pour off the top? Thanks. I was worried about the draining and rinsing, too. I have a mesh tool (like a window screen), and didn’t lose much at all. I did get rid of the foam, though, and that was good. I also didn’t do a “thorough” rinse, just a quick wash.
I’m SO excited to try this! My daughter is allergic to wheat, corn and now oats, making breakfasts a little limited. She misses her oatmeal. I tired this porridge and love it. I did decrease the milk and added coconut water because I had some I needed to use. I am single so I have probably have 2 of the four servings left. I had a hard time leaving it alone. I used my nutramill to grind the buckwheat and quinoa. I set the machine to coarse ground but it looked like flour to me. Next time I will use the spice grinder assuming its needs to be more coarse. Then I added the hot water. I am assuming you do not stir the water into the grains which I did and there was no possible way to drain and rinse (due to the flour nature of mine) It has a nice flavor. Very different then oatmeal but will try this recipe again till I master! Oops, I just did that too,mine is like flour, so I guess I wont be able to rinse before cooking? Is that a problem, hope it will still work…. As I have come to a stand still on food (re-pre-soaking etc), until I can have a clearer peace of mind and move on. Your researched opinion would be good to hear??? Also – I am a single woman in my early 50’s. My daughter and grandchildren live in in another state. I also garden and love to grow organic vegetables. I love your tips on storage; dehydration; cultures, etc. Any tips for smaller family sizes would be appreciated. How do cut a recipe or anything!! Thank you!! Making this with diluted apple juice instead of milk (for a dairy free version) gives a flavour boost. I leave out the sugar when making hot cereals with apple juice. I am seeing this for the first time, thank you for posting it! I have never tried buckwheat in anything sweet, but this porridge will make me try for the first time. I am so glad that domestically-grown quinoa has gotten so much easier to find! This sounds perfect! We eat oatmeal everyday, and I think breakfast is sometimes a forgotten-meal in terms of adventure. What delicious ideas! I don’t have a grinder. Can I leave the pseudo-grains as they are? Will they take longer to cook? Also can I sub coconut milk for milk? Do you use raw buckwheat groats or roasted (kasha)? If you buy kasha can you soak it? Buy cheap nfl Jerseys at largest international online nfl Jerseys shop from us, save at least 60% also free shipping. I used organic barley (not pearled) in the place of the buckwheat because I didn’t have any. This recipe is delicious! I will try it with the buckwheat when I get some. Also I just added the ghee w/o sautéing, I grated the ginger and used ground cinnamon. It came together quickly this morning. Thanks so much for what you’re doing. I made this and liked it. Next time I might try chopping the garlic into finer bits and sautéing it at night when soaking the seeds, and letting the ghee and ginger cool overnight. Adding the wet grains to the hot oil made everything sputter, so starting everything cold will work better. Also, frying the ginger for three minutes made my ginger burn (I could have watched it more closely, but didn’t — operator error). I made mine with flax milk. I also cooked it for 20 minutes to get it thick enough. I will definitely make this again — thank you! I assume you’re supposed to leave the grains and water to soak IN THE REFRIGERATOR overnight… am I wrong? Are you supposed to leave them out? Or does it not matter? Please help Jenny! doesn’t appear that you respond to comments here but asking anyway – any idea how this might freeze? i tripled and then discovered my littles do not care for it so it is all on me to enjoy, which might take awhile . . .